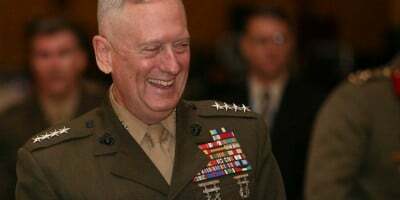 President-elect Donald Trump has selected retired Marine General James Mattis to exercise civilian control over the Department of Defense. Originally known as the Department of War, it was renamed Department of Defense in 1949. But war is precisely what Mattis, known as “Mad Dog,” has enthusiastically done throughout his career. In 2005, Mattis declared, “It’s fun to shoot some people.” That was one year after he oversaw the Battle of Fallujah in Iraq, which began in April 2004, after four Blackwater Security Consulting mercenaries were killed and their bodies mutilated. In retaliation, US forces attacked the city and killed 736 people. At least 60 percent of them were women and children, according to independent journalist Dahr Jamail, who interviewed doctors at Fallujah General Hospital and at other small clinics inside the city both during and after the April siege. In November 2004 NBC News correspondent Kevin Sites, embedded with the US Marines, heard Staff Sgt. Sam Mortimer radio that “everything to the west is weapons free.” Weapons Free, explained Sites, “means the Marines can shoot whatever they see — it’s all considered hostile.” The rules of engagement come from the top, and Mattis was in charge. Mattis’ enthusiasm for battle may lead us into a war with Iran. A vigorous critic of the nuclear deal with Iran, Mattis said in an April 2016 speech at the Center for Strategic and International Studies that the Iranian regime is “the single most enduring threat to stability and peace in the Middle East.” He added, however, “there’s no going back” on the deal and it would be an issue for the next president. CIA Director John Brennan recently warned of the dangers of canceling the Iran deal, saying it would be “disastrous” and “the height of folly.” In a BBC interview, Brennan explained that dismantling the deal would set off an arms race in the Middle East and embolden the hard-liners in the Iranian government. To his credit, Mattis has been clear-eyed about blowback from US policy on Israel. He noted the United States is paying a “security price” in the Middle East because the US is considered biased in favor of Israel, and Israel is in danger of becoming an “apartheid” state. Mattis criticized Israel for building settlements in the occupied West Bank, saying they “are going to make it impossible to maintain the two-state option.” He added that the settlements might weaken Israel as a Jewish and Democratic state and could lead to apartheid. Indeed, former high-level FBI interrogators, including Ali Soufan and Dan Coleman, maintain that a person being tortured will say anything to get the torture to stop — even providing false information. The best results, interrogators add, are obtained with humane methods. “If there’s any concern at all [about Mattis], it’s the principle of civilian control over the military. This role was never intended to be a kind of Joint Chiefs of Staff on steroids, and that’s the biggest single risk tied to Mattis,” a former senior Pentagon official told The Washington Post. The framers of the Constitution were wary of putting the military in charge of making foreign policy, which explicitly resides in the executive branch; that is, the president as commander-in-chief and his secretary of defense. Let’s hope Trump can maintain that position in the face of inevitable militaristic advice from Mattis, Flynn and Pompeo. Trump frequently makes contradictory statements about foreign policy. During the campaign, he insisted that he opposed the Iraq War and Libya regime change, when in fact he supported both. In fact, Trump called for all US troops in the Middle East to overthrow Libyan president Muammar Gaddafi. It is our challenge to hold Trump’s feet to the fire in every way we can — speaking out, writing, demonstrating, and pressuring Congress and the White House. We cannot relent in demanding peace. Marjorie Cohn is professor emerita at Thomas Jefferson School of Law, former president of the National Lawyers Guild and on the advisory board of Veterans for Peace. Her books include Cowboy Republic: Six Ways the Bush Gang Has Defied the Law; The United States and Torture: Interrogation, Incarceration, and Abuse and Drones and Targeted Killing: Legal, Moral, and Geopolitical Issues. Visit her website: MarjorieCohn.com. Follow her on Twitter: @MarjorieCohn.